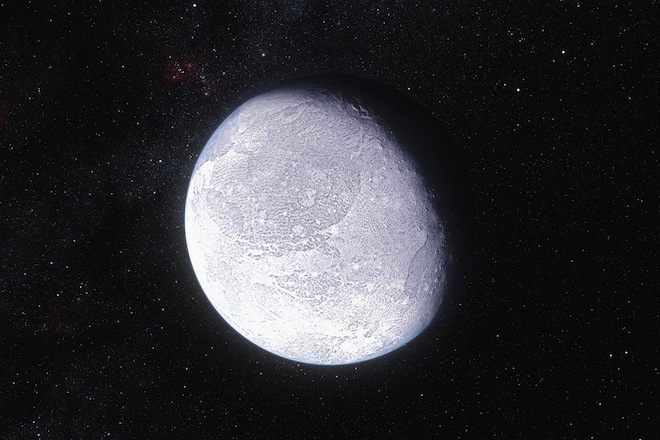 Astronomers from France have made the first accurate measurements of the distant dwarf planet Eris, and found that it’s an almost exact doppelganger of the declassified ninth planet, Pluto. Eris was discovered in 2005 and initial measurements pegged its diameter at a fraction larger than that of Pluto. This finding, and the possibility that there were other giant objects in the icy Kuiper belt beyond Neptune, put Pluto’s planetary status into question. The next year the International Astronomical Union redefined the term planet in such a way that Pluto would be demoted to dwarf planet, and join the likes of Ceres, Haumea and Eris in this sub-classification. The move remains controversial amongst some astronomers. In November 2010, Eris passed in front a faint star and it was caught by telescopes in Chile — including the Belgian TRAPPIST telescope at ESO’s La Silla Observatory. By tracking the distorted starlight, planet hunters were able to make accurate measurements of its size and surface. Eris is the most distant object in the Solar System to be observed through starlight wobble. It’s a technique similar to the one used to sniff out very distant exoplanets. The team from Pierre et Marie Curie University and Observatory of Paris found that Eris is a distinctly sphere-shaped object with a diameter of 2,326 kilometres — only a fraction smaller than previous measurements but it makes it almost identical to Pluto’s 2,300 to 2,400 km width. Also, the surface of Eris was found to be surprisingly bright, which could suggest that the dwarf is covered in ice which is somehow refreshed over time (or else the ice’s bright shine would be darkened by cosmic rays and micro-meteorite impacts). One theory is that Eris has a methane-rich atmosphere. In the cold depths of space it freezes to the surface, but as Eris’ elliptical orbit brings it closer to the Sun the surface heats up and becomes a thin, gassy atmosphere. Back in space, it freezes into a new layer of ice again.